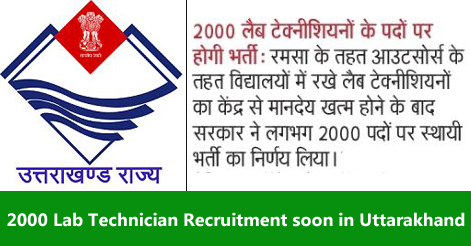 Uttarakhand Government has taken decision for the recruitment of 2000 Lab Technician on permanent basis in the state. Earlier Centre cut out funding for Lab Technician in Government Schools in Uttarakhand. Those Lab Technician were recruited by outsourcing through Rashtriya Madhyamik Shiksha Abhiyan RMSA. State Govt will recruit around 2000 Lab Technician in the Govt schools in Uttarakhand. Lab Technician seats are vacant after the funding from Centre Govt stopped. Help us to improve this article/job posting "2000 Lab Technician Recruitment soon in Uttarakhand". We would be glad if you can comment below and provide your valuable suggestions and feedback. If this page have any wrong information/list or out of context content, then you can report us as well. sir lab technician ki post ke liye form kahan se uplabadh honge. aur iski last date kab hogi. pls iski website address bata dein. sir plz give detail about this job1.qwalification 2.age 3.form issue 4.submission date.etc. HI SIR…WHEN WILL COME THIS POST.PLESE TELL ME DETAIL ABOUT THIS. sir my contect no.9720555381..plzzzzz send me detail by massage. sir please send the detail by massage. Thanks sir as soon as possible give us a opportunity to do job under gov sector. I want details about this job. sir lab technician/assistent ke form kaha se uplabhedh honge. My name is Neeraj negi from Nainital (uttrakhand) Qualifications -B.sc I want details about this job. What is the eligibility for the post of lab technician? Detail about this vaccancy in lab technician. Dear sir kindly let me know, what is the current status of these lab tech posts. Pl inform me about the age eligibility. I have completed bsc mlt. Pls inform me about age limit. Sir ji plz tell me when will come post of lab technician..
sir iski detail kha se milegi ..
sir i have completed bsc mlt. sir plz full information send my email and 8802256154 my contact no. Pls give detail about this vacancy. Qualifications, age limit etc. plz tell me when will come post of lab technician. Current studying in PG.DMLT from Mumbai,I have completed Bsc .MLT from Mumbai. Working in sapphire hospital kalwa. 2 year experience of Bethany hospital Thane(SRL diagnostic Dr.phadke’s laboratory). 6month internship in Bethany hospital thane. My name is Rajani koranga sir, please give information for lab technician job. Dear sir I have done Bscmlt in 2004.presently I m working with O.k.Lab as a senior lab technician.please advise me how apply for the job. Sir, Confirm when these post will be come. When these post will be come ?